A perfect tool for scaffolding deeper understanding and analysis for Divergent! This is my go-to tool for helping students process key details and providing regular reading quizzes without drowning myself in grading. 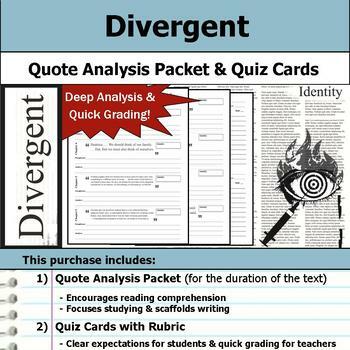 This purchase includes a quote analysis packet for students that covers the duration of the text. Also included is a quiz card and rubric template (four per page to save you copies!) and a note to teachers with tips for using this product in your classroom as well as an explanation of how I grade about 25 quizzes in five minutes. I've found that students respond well to having a preview of the quiz before actually taking it. The quote analysis packet presents multiple key quotes from each section of the text. Students are then quizzed over one of the quotes, but they don't know which quote until quiz time. I find this helps me keep my other classes honest without creating extra work for me because I can easily quiz each hour over a different quote (or not) if needed. The consistent format and clear grading expectations are helpful to all students, including those with learning accommodations. Additionally, this collection of key quotes is a great springboard for in-class discussions and essay prompts. The scaffolded approach helps students bridge from reading for plot points to reading for deeper understanding, themes, and life lessons. Yay for classic literature, and double yay for tools help students understand it!